Train from the comfort of your own workout room, basement, den or bedroom with the help of this Everlast 2 Station Heavy Bag Stand. It is constructed of sturdy and durable steel tubing that provides a foundation that will hold the bag firmly on its axis, and it is covered with a powder-coated finish. This punching bag stand provides the user with two training methods, allowing the user to maximize both speed and power. Simply attach a speed bag or a heavy bag to this stand to suit your personal needs. The stand requires some easy adult assembly and includes all of the necessary hardware. It is compatible with any bag that weighs up to 100 lbs. and is ideal for performing exercises that target your upper body and core. 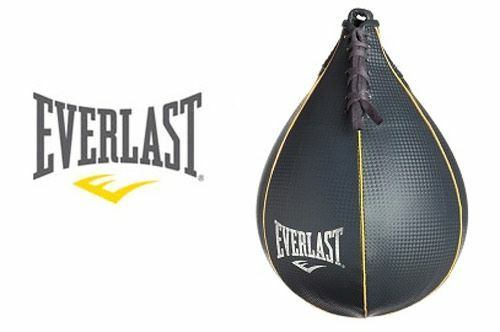 Pair with additional Everlast fitness equipment to achieve the total workout. 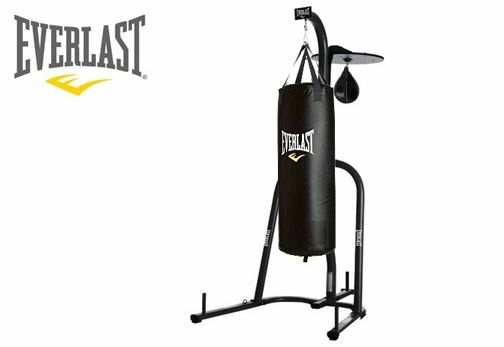 This Everlast heavy bag stand will make an ideal gift for anyone who wants to box and workout from the comfort of their own home. Medium size 9"x6" for beginners to intermediate uses.